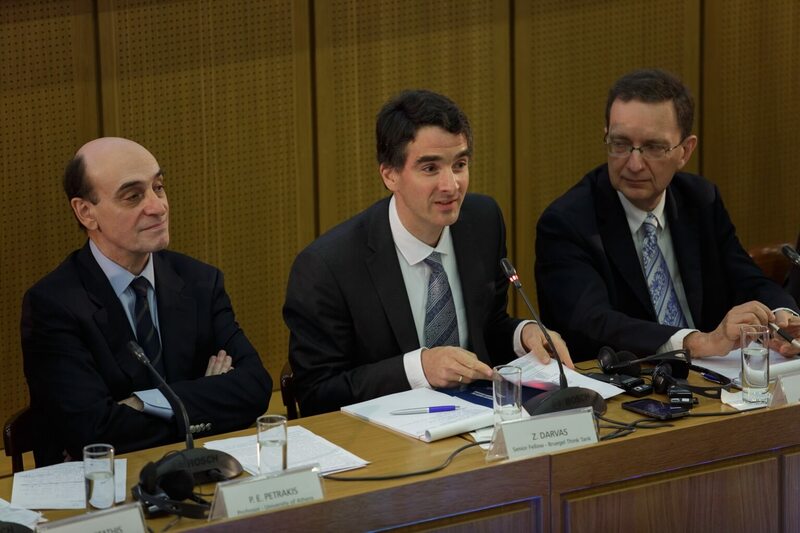 On Wednesday, May 25, 2016 at the Auditorium A. Argyriadis, Main Building of the National University of Athens, held a workshop entitled "Development Conditions for the Greek Economy" organized by the E-Learning of the National University of Athens and the independent "Think Tank" in Deep Analysis. Main aim of the workshop was to enlighten participants regarding the development and growth problem of Greece as well as to discuss upon different approaches on how the Greek Economy can escape the persistent and long-term stagnation. The workshop was held on the occasion of the publication of the book: «A new Growth Model for the Greek Economy: Requirements for Long-Term Sustainability» edited by Professor Panayotis Petrakis. The book synthesizes the different views of 32 international distinguished scholars and researchers on the field of Economics. Greetings were addressed by Dr. MELETIOS-ATHANASSIOS DIMOPOULOS Rector of the National University of Athens while the Panel consists of five members of global reputation academic staff: PANAGIOTIS PETRAKIS Professor of the Athens University of Economics Department, HAROLD JAMES Professor of History and International Affairs and Professor at the headquarters of European Studies Claude and Lore Kelly of University Princeton, ZSOLT DARVAS Senior Fellow of the Institute Bruegel in Brussels, the Institute of Economics of the Hungarian Academy of Sciences and the University Corvinus Budapest, PAOLO MANASSE Professor of Macroeconomics at the University of Bologna, KLAUS SCHRADER Senior economist and deputy Director of the Centre for European Policy at the Institute of World Economy Kiel and the MICHAEL CHALIASSOS Chairholder Macroeconomic and Financial Science at Goethe University Frankfurt and Founder and Director of the Economic Policy Research Centre Research Network (CEPR). The conference was moderated by journalist ARGYRIS PAPASTATHIS. The guest-speakers answered questions about the Greek economy and referred to desirable conditions for its growth as well as policies and actions to exit the economic crisis.